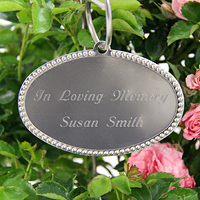 A personalized engraving tag is available as an additional option. THE TAG MUST BE INCLUDED AS AN ADDITIONAL ITEM IN THE CART IN ORDER FOR IT TO BE INCLUDED. PLEASE DO NOT INCLUDE PERSONALIZATION IN THE ORDERING PROCESS IF YOU DO NOT WANT THE PERSONALIZED TAG. Each item, the tree and the tag would need to be added to the cart separately. These 100% stainless steel gift tree tags add that special touch and are tough enough to be used outdoors. Available in the product drop down for an additional $19.95. Two lines personalized 20 characters each including spacing.